The Dubai Opera is a modern, world-class performing arts venue at Downtown Dubai. It hosts a varied program of shows and events including opera, musicals, ballet, theatre, rock, pop, jazz, and comedy. The venue was designed by Janus Rostock of Atkins. It opened in 2016 and is modelled on the shape of a dhow, a traditional sailing vessel. The main theatre can be configured in several different ways and can seat up to 2,000 people. The Dubai Opera is centrepiece of the Opera District at Downtown Dubai. It is located southwest of the Burj Khalifa. 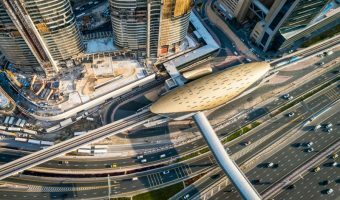 The closest Metro station is Burj Khalifa/Dubai Mall. It’s a fair distance (0.4 miles) from the station but the walk is pleasant and interesting. On the way there’s the Dubai Mall, Dubai Fountain, and Burj Khalifa. There’s a taxi drop-off zone near the venue. Paid car parking is also available. Tickets can be purchased online from the official Dubai Opera website (see information box at the end of this page). They can also be bought in person at the box office (open daily). The opera house boasts its own rooftop restaurant. 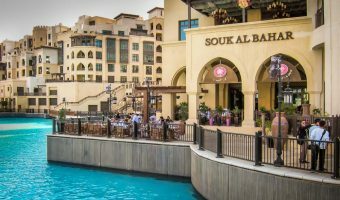 There’s a multitude of further dining options at Souk Al Bahar, the Dubai Mall, and nearby hotels. 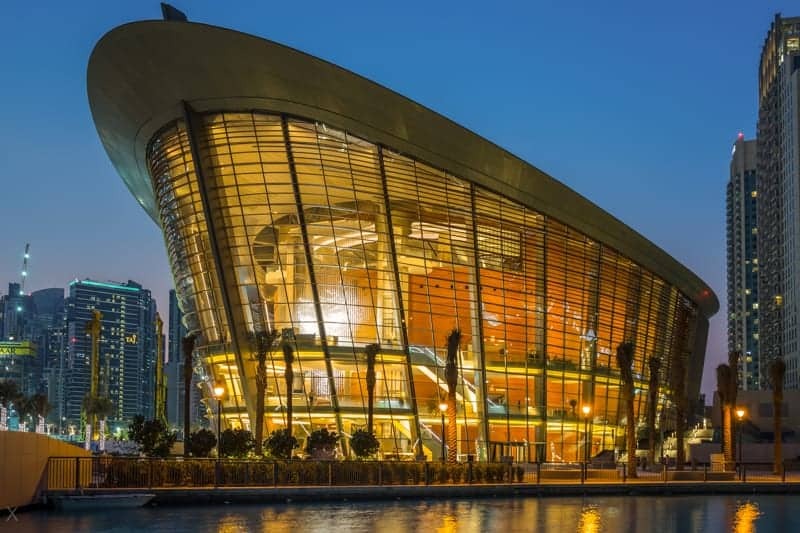 The Dubai Opera opened in 2016 with a performance by legendary Spanish tenor Placido Domingo. The program of upcoming shows and events is listed below. The shows calendar was last updated on April 15, 2019 . The Dubai Aquarium & Underwater Zoo (0.5 miles) - Aquarium at the Dubai Mall. KidZania (0.5 miles) - Edutainment centre at the Dubai Mall. Reel Cinemas Dubai Mall (0.6 miles) - 26-screen cinema at the Dubai Mall. Souk Al Bahar (0.3 miles) - Souk near the Dubai Mall. At.mosphere (0.2 miles) - Restaurant and lounge on Level 122 of the Burj Khalifa. Booking essential for this once-in-a-lifetime experience. Thiptara (0.2 miles) - Thai restaurant at the Palace Downtown. Indoor and outdoor dining areas. Terrace overlooks the Burj Lake and offers good views of the Dubai Fountain and Burj Khalifa. Ewaan (0.3 miles) - Arabic restaurant on the ground floor of the Palace Downtown. Live cooking stations. Friday brunch. Indoor and outdoor seating. View of the Burj Khalifa. Asado (0.3 miles) - Argentinian grill at the Palace Downtown. Waterfront terrace offers great view of the Burj Khalifa. Claw (0.3 miles) - Lively American bar and grill at Souk Al Bahar. Menu includes bucket of crabs and shellfish, burgers, seafood, steaks, and BBQ dishes. Licensed bar. Ladies’ nights, live sports, and Friday brunch. Bombay Brasserie (0.4 miles) - High-end Indian restaurant at the Taj Dubai in Business Bay. Features an open kitchen and luxurious interior. Offers good views of Burj Khalifa. Texas Roadhouse (0.4 miles) - American restaurant at the Dubai Mall. Offers steaks, ribs, chicken, and burgers. Large portions. Reasonably priced. Indoor and outdoor dining areas. Outdoor terrace offers view of the Dubai Fountain. Entrecote Café de Paris (0.5 miles) - French restaurant at the Dubai Mall. 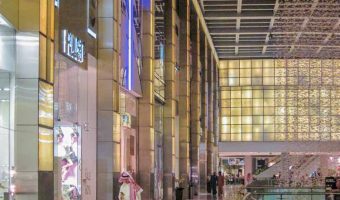 Offers excellent view of the Dubai Mall Waterfall. Burj Khalifa/Dubai Mall Metro Station (0.4 miles) - Metro station on the Red Line. Map showing location of Dubai Opera. ‘Souk’ at Downtown Dubai. 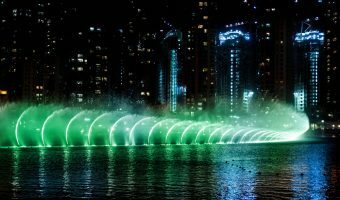 Dine at one of the restaurants here for a great view of the Dubai Fountain.